Mt. St. Helens "Ape Cave"
"Ape Cave" in the Gifford Pinchot National Forest went unnoticed for about 2,000 years. Then in 1951, Larry Johnson of Amboy, Washington was logging in the area when he discovered the entrance to the lava tube cave, which was at the time, almost completely blocked with vegetation and timber growth. Johnson then related 'the find' to the Harry Reese family and they investigated and explored what is now known as Ape Cave. Why is it called Ape Cave? Harry Reese was Scoutmaster of a Boy Scout Troop called "The Apes;" so named because of their interest in the legend of Mt. St. Helens and its Native American tales of ole sasquatch. Thus the cave they explored in those years was tagged "Ape Cave" after the Scout Troop of that day. Contrary to a published bigfoot book, the 1924 Fred Beck Story in Ape Canyon was not the motivation for the naming of the 1951 Ape Cave. The canyon story was on the other side of the mammoth mountain from Ape Cave. The Scouts were influenced by the Native Americans and their campfire stories, which did not include Fred Beck but rather focused on Native encounters with what they perceived as the mountain's hairy apes in the '50's. There are no stories to support the notion that sasquatches ever inhabited Ape Cave. The cave itself was formed 2,000 years ago, what is now a cave was once a stream bed. An eruption from the mountain's summit filled the gully with lava, which did not harden consistently. 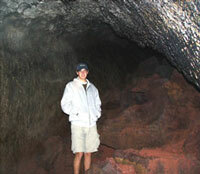 As the outward part of the flow cooled and hardened, the inner strand kept moving out the bottom of the cave. The lava flowed for 3 to 6 months, resulting in the cave as we know it today; at 12,810 feet, it is the longest such formation in North America. Walls average 30 feet thick. The forests grew up and over the main entrance until it was discovered by Lawrence "Larry" Johnson in 1951. In a round about way, it was indeed named after the legendary sasquatch by way of a Boy Scout Troop named "The Apes." According to Native American legend, those apes were the elusive sasquatch.